Sound great! However, with the tech giant's record for responding to requests to remove posts by murderers of their victims, I don't know. I am also concerned about the tool being abused by foes not friends. All in All, let's hope the tool can prevent a suicide. I'm all for it! If a Facebook friend posts something that you feel indicates he or she could be thinking about self harm, you'll be able to click the little arrow at the top right of the post and click "Report Post." There, you'll be given the options to contact the friend who made the post, contact another friend for support or contact a suicide helpline, the University of Washington reported on Wednesday. After that, Facebook will look at the post. 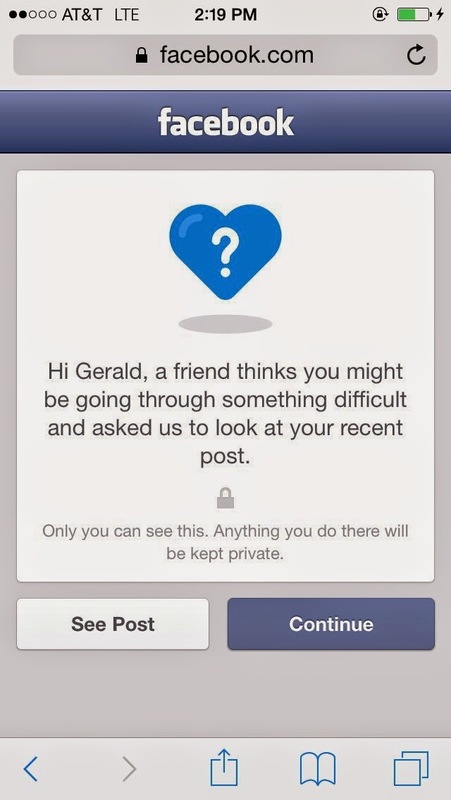 If Facebook feels like the post indicates distress, it will contact the person who posted it. Then they'll see options to reach out to a friend or get tips and support.